What was previously accomplished between two rats has now been done with humans. While that doesn’t sound like much of a feat, consider the fact that the accomplishment is brain-to-brain interfacing. 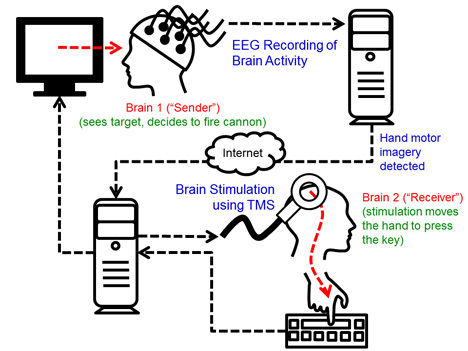 A facet of computation neuroscience, this type of communication involves controlling another’s movements purely through thought. Researchers Rajesh Rao and Andrea Stocco replaced the rats in this experiment. For the experiment, Rao and Stocco linked themselves via Skype from opposite ends of campus at the University of Washington. 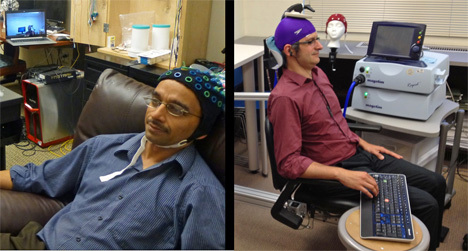 While Rao wore an electrode-covered skull cap connected to an EEG machine (the ‘output’ channel), Stocco wore a swim cap that was connected to a transcranial magnetic stimulation machine (the ‘input’ channel). Both viewed the same video game feed. On Rao’s end, a command was to be completed with the keyboard’s spacebar. Instead of physically pressing the button, however, he merely thought of the action. Across campus, a sensor in the swim cap worn by Stocco stimulated his motor cortex, causing his hand to move in accordance with the Skype signal sent by Rao. The researchers hope two-way communication will eventually be possible, with theoretical applications of helping the disabled or landing a plane through an incapacitated pilot. See more in Cybernetics or under Technology. September, 2013.